Or not. 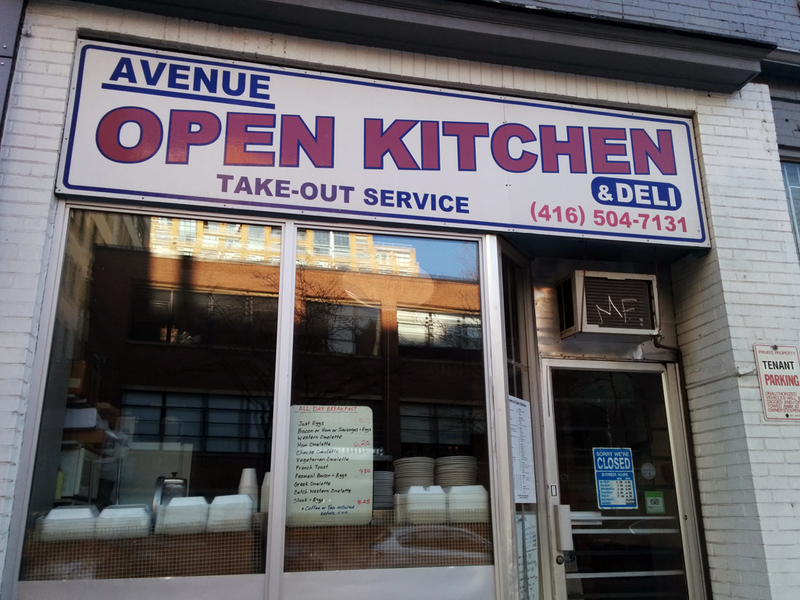 Apparently the city’s best cheap breakfast place, Avenue Open Kitchen is not open on weekends. I was floored when I saw the sign. A brief panic flashed as I contemplated a 20 minute walk to R Squared, voted best cafe for free wifi, on an empty stomach. I shuddered and was dreading it. 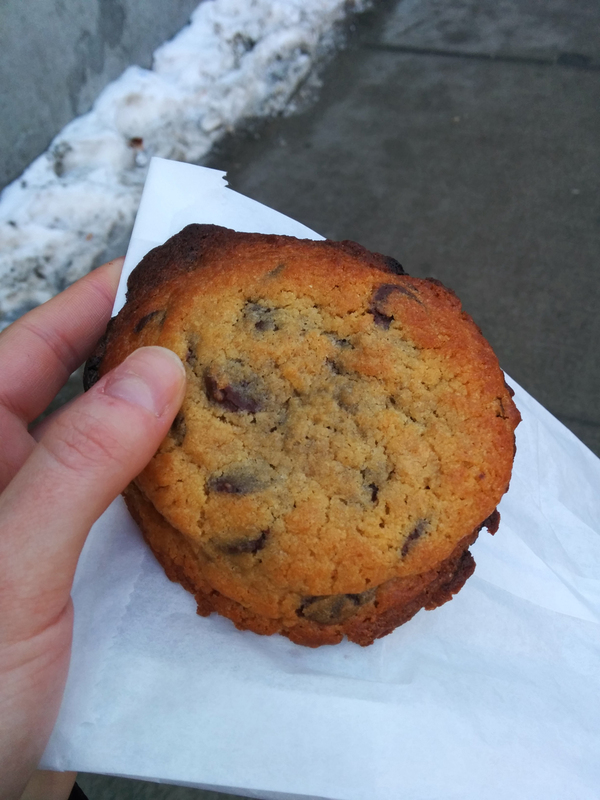 Thankfully Le Gourmand, aka best cookie in the city, was just around the corner from Avenue Open Kitchen so we backtracked one block. Which is not that big of a sacrifice given it meant the difference between walking on an empty stomach or snacking the whole way there. There were very few cookies left, thankfully Brent spotted another tray and rather than being evil and snatching up the last two chocolate chip cookies, we got the second last one and a chocolate chip walnut cookie. The difference between the two was rather stark. The chocolate chip cookie was so soft, the walnut one was crunchier but the walnuts made up for that. 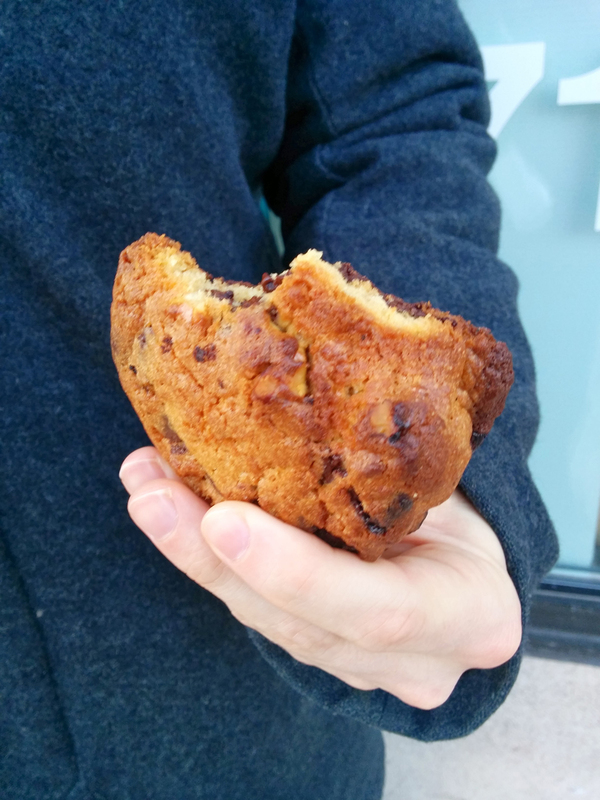 I am still of the mind that the best cookies are the pudding-based cookies from Artisano Bakery though. 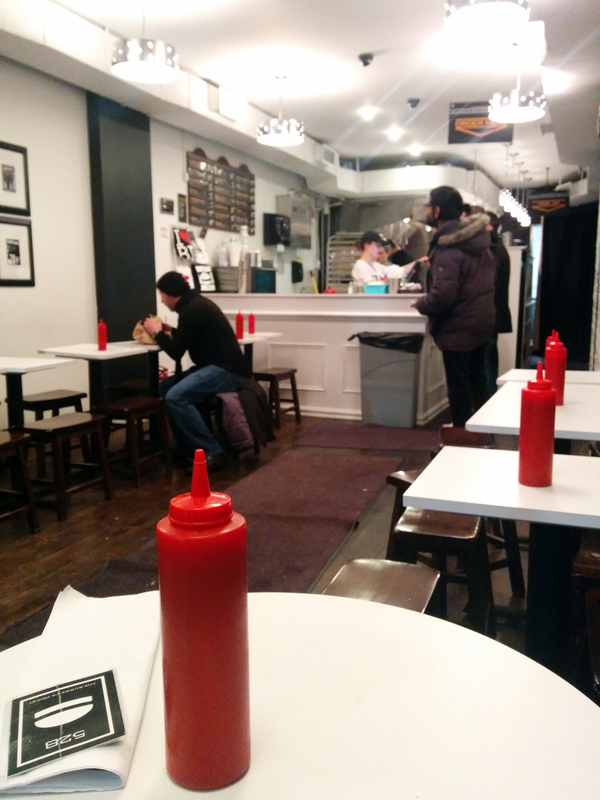 We never made it to R Squared because we passed by P&L Burgers (an offshoot of Parts & Labour) just after open, and it was not yet busy. It was the right decision, we had the place all to ourselves and we had the first burgers of the day. 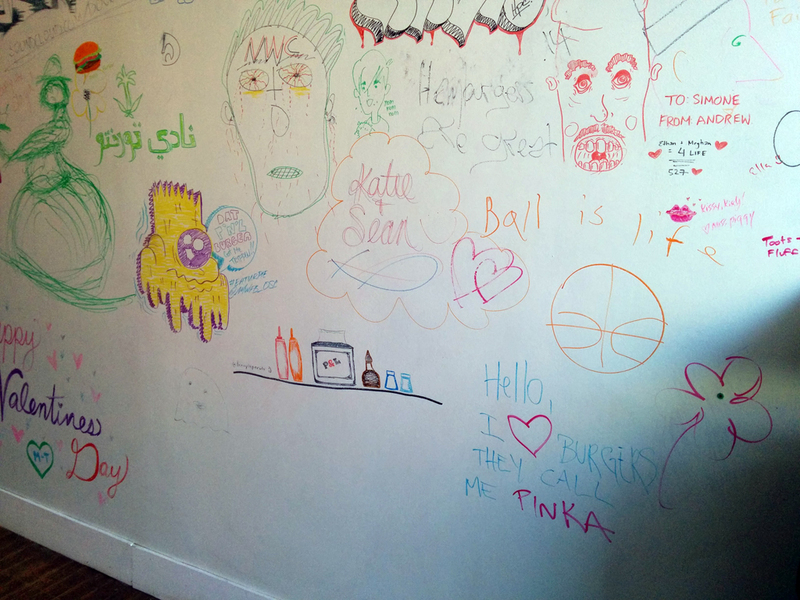 P&L has one wall dedicated to drawings, there are washable markers nearby and I admit: I got way too much giddy joy from being able to draw all over the wall, alas I lacked inspiration and resorted to scribbling. 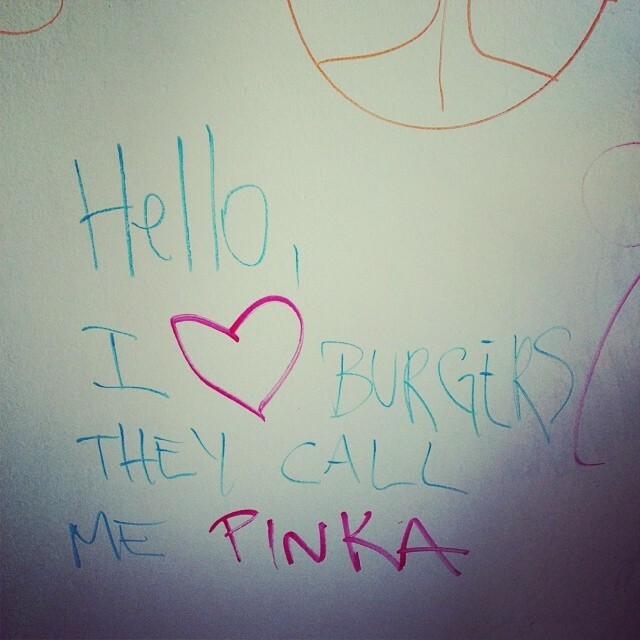 The burgers were fancier than Burger Priest, the bun being something more than just white bread. But how did the burger as a whole fair? It was definietely delicoius, a good alternative if you do have the time for Burger Priest- but it is no Burger Priest. The cheese on my burger was on the reserved side. 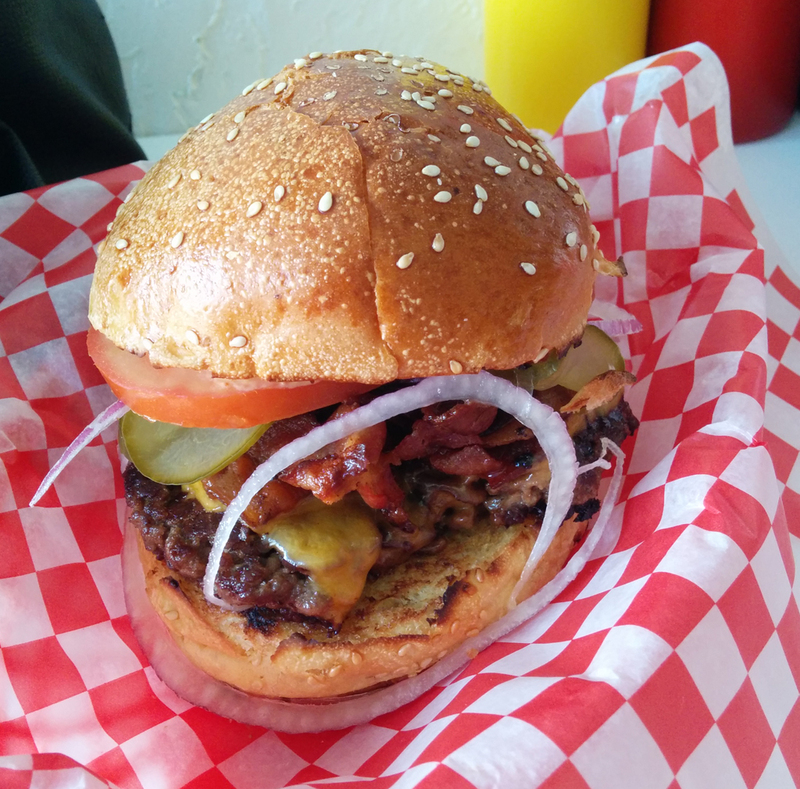 They do get bonus points for the bacon, adding that much needed crunch that was missing at Burger Priest (it was a sopping cheesey mess of goodness). On our way back home we passed through Kensington Market to pick up some organic goodies from the best health store in the city. It was one of the weirdest experiences of my life. Never have I felt so out of place as I did there. There was so much stuff I had never even heard of. 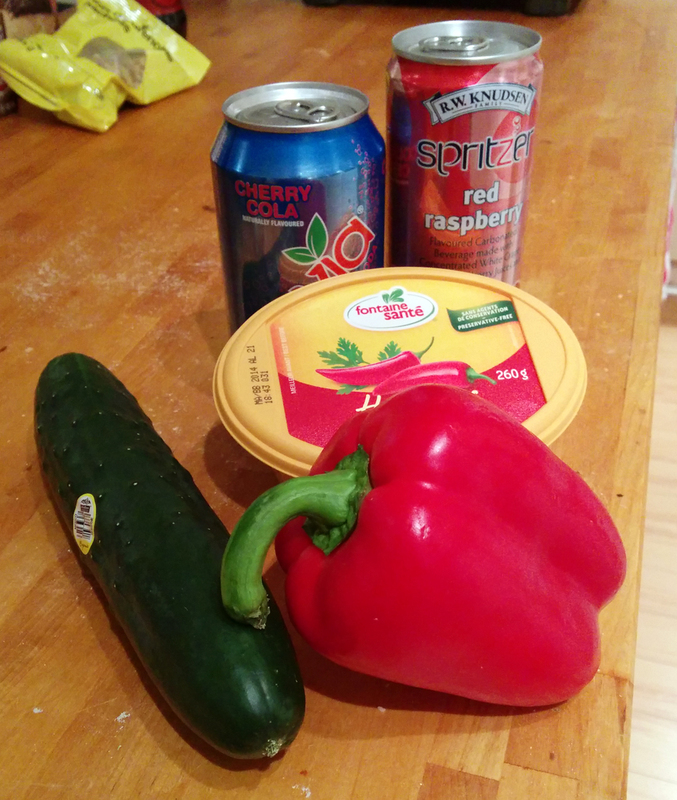 We managed to find some recognizable items at last: soda, hummus and some veggies for the hummus. But not without getting lost. We somehow ended up in the pharmacy section. This place is not big, it is tiny and cramped. I was glad to be out of there. The veggies and hummus tasted no different than non-organic. The raspberry soda tasted much less artificial, but there is no way I am going that far for soda regularly. We were worried that we might never get around to Avenue Open Kitchen for breakfast, owing to Brent working 9-5, making it hard to go out for food in the middle of the day. That is unless his day doesn’t start til after 1pm! We had found a scheduling loophole: he had to stay late at work, therefore went in late and rejoice! we finally got our best cheap breakfast fix. From the outside Avenue Open Kitchen looks less than spectacular and yet we were still worried that on a Tuesday at noon we might find ourselves walking an extra 20 minutes for brunch to R Squared (again our backup). We lucked out and got the last table, the place was busy. 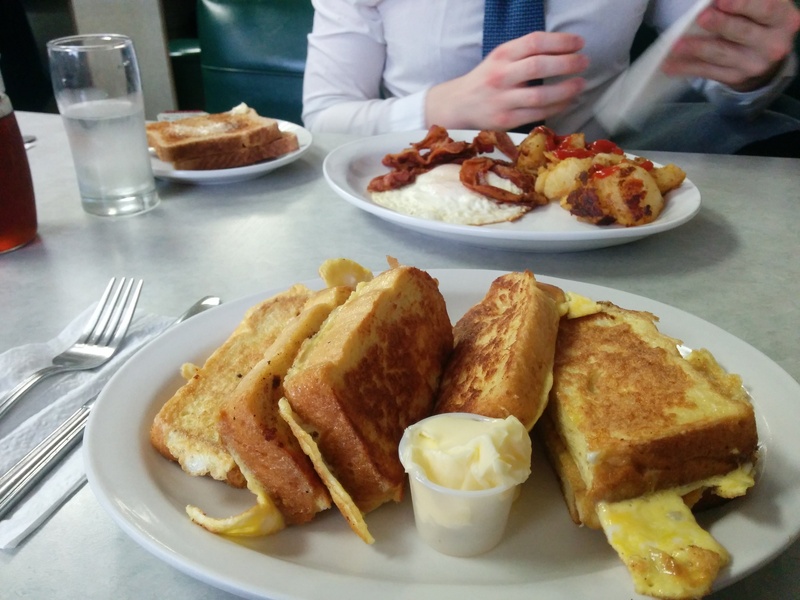 No sooner had we placed our order, I was staring down a mountain of french toast. I had been expecting 1-2 slices, not what looked like half a loaf. One bite and I knew why-fore the generous portions: it was out of this world amazing. Somehow the bread managed to retain some softness with just the smallest outer layer of crispiness. It was somehow light and fluffy and not overly greasy. We both agreed that I had won, but you can’t go wrong with a plate of eggs and bacon and hash browns either. 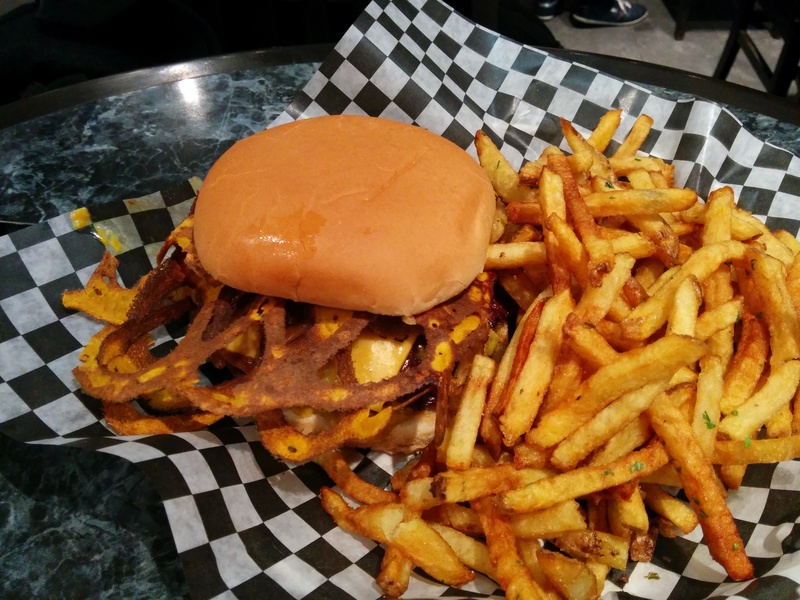 Holy Chuck did not live up to its hype, I am sorry to say. I went in there with high expectations, heaven-high if you will. Either we had been given a less-than-stellar batch, or Holy Chuck is not all it’s made out to be. I ordered the signature, The Holy Chuck: a double cheeseburger with bacon and onions. I found it surprisingly bland. The cheese was those gross plastic squares that are sad excuses for cheese. I was slightly appalled. Even worse, the cheese buried the bacon so much that you could barely taste it. The meat itself was also bland and plain, not good for a price tag that large. I am willing to give it another try, but I will not go out of my way (i.e. : it has to be someone else’s suggestions and I not wanting to be rude, will say “sure, let’s go” and hopefully it will be good). It is a mystery and I really do hope it was just a bad batch. On the plus side, the fries were really good? Still they do not hold a candle to Burger’s priest. 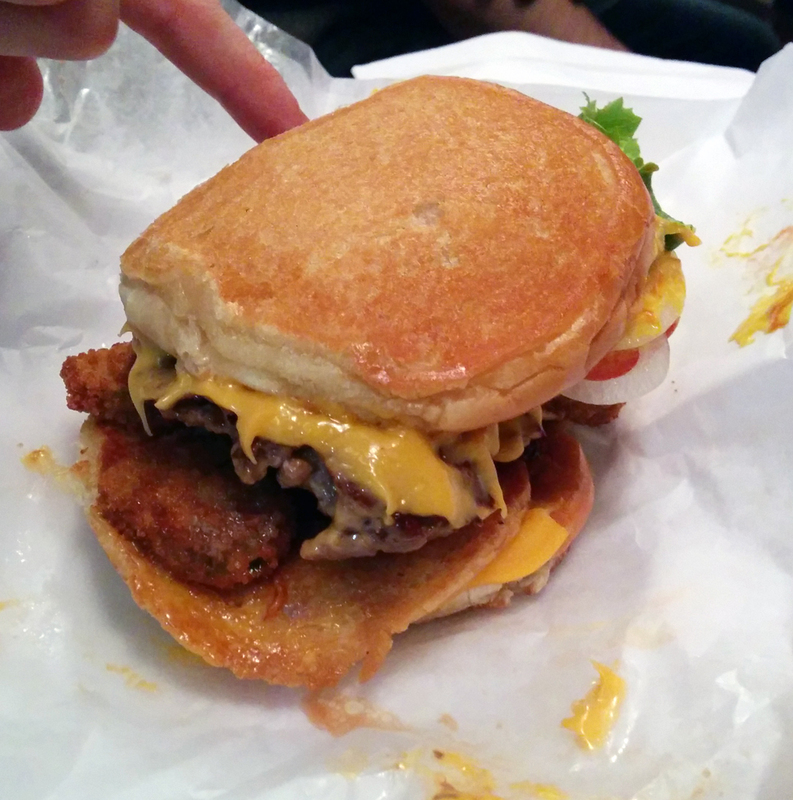 I did steal a bite of Brent’s burger, The Big Bad Wolf, which was a take on In N Out’s “animal style” (mustard-fried burger patty) but it was a sloppy mess. Far too much mustard. Sadly I was too full for dessert, so I might be going back after all: they have deep-fried Nutella balls (not quite sure how that works). 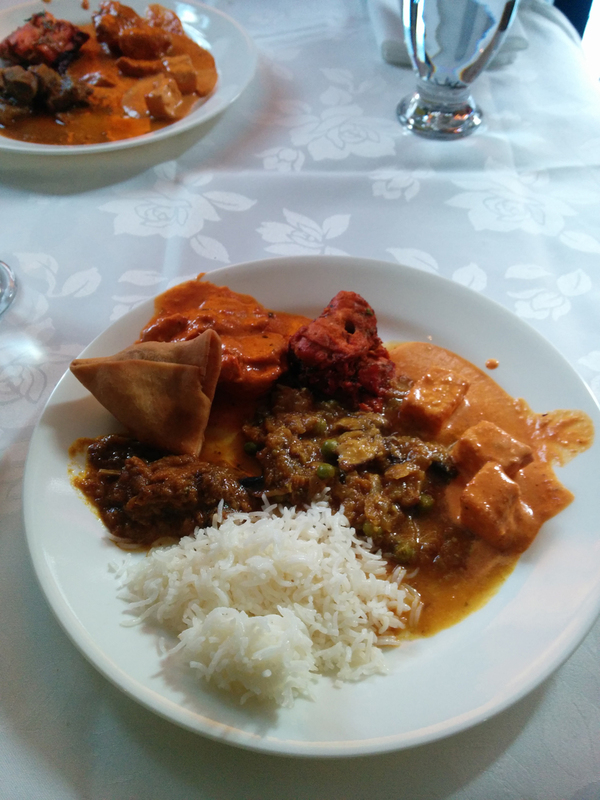 Best Indian buffet was recently updated, luckily to a place, Banjara, that was open on Saturdays so Brent did not have to skip work for it. It also happened to be around the corner from best new cafe of 2013. Would we live to regret going to a cafe before going to an all-you-can-eat buffet? Nope. It was so tempting to order one of every baked good at De Mello Palheta, but I resisted, thinking of the buffet tables full of food around the corner. 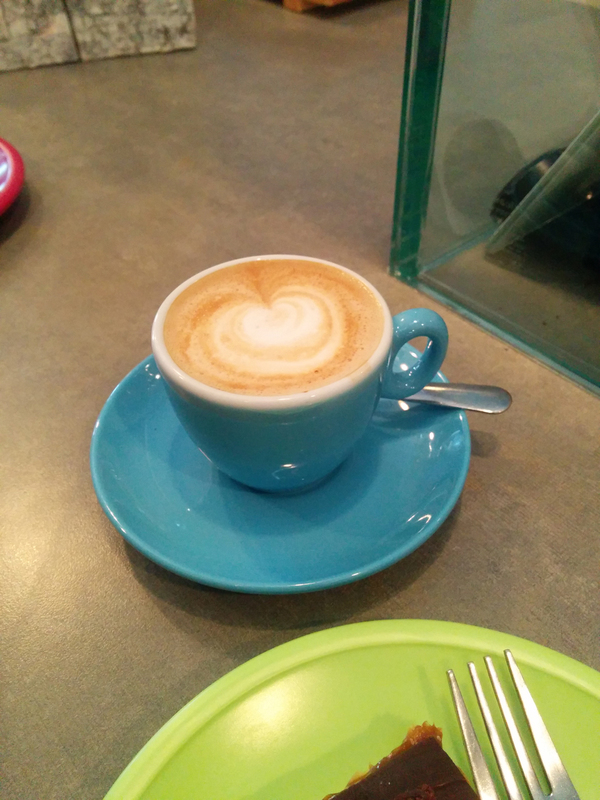 Thankfully my latte was adorably tiny. I had no idea what I ordered, it was something with a p—- latte. 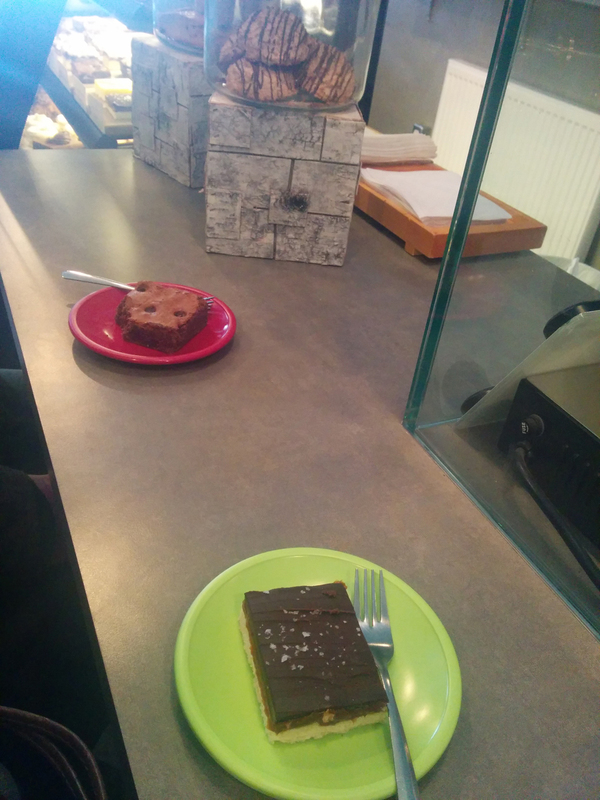 The dulce de leche square was amazing,the sour cherry brownie was more of a cake than a brownie, but still good. I was intrigued by all the coffee extracting paraphernalia that they had behind the counter, but it was hard to tell if it was for show or for actual use. The regular coffee menu was also confusing, part of the reason I ordered the latte was because I did not know what an “extraction” or something or other coffee even was and it cost about the same. 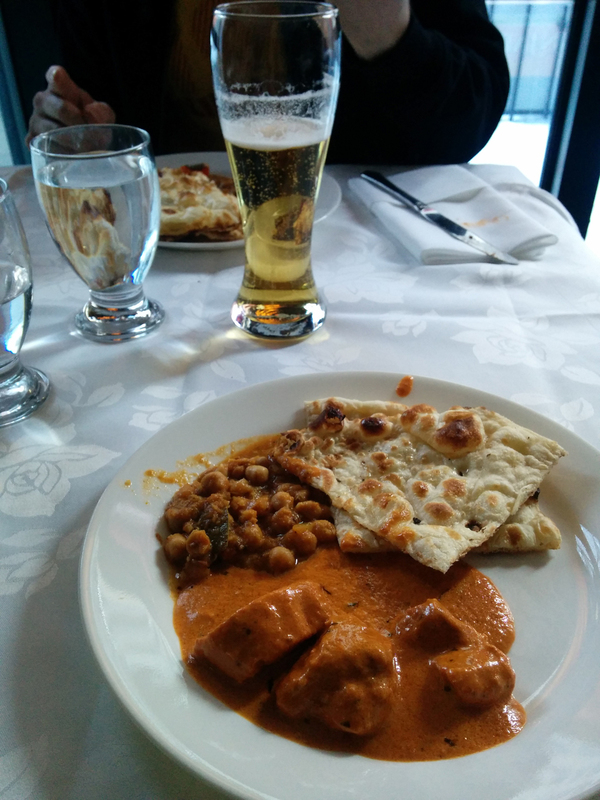 I had high expectations for Banjara, last time we went the butter chicken was amazing. To be honest I found it about the same as the places on Queen Street, the difference being that Banjara has buffet on weekends as well. The only other thing was that they had maybe a few more dishes on offer, most notably the paneer was delicious. I wish they would bring you a basket of naan to the table though. After our first plates we sat there staring at each other, our plates were covered in delicious sauce and we had nothing to sop it up with, the naan at the buffet had run out. Once again I had to embarrassingly admit defeat the buffet table, after a paltry showing of eating only two plates- at least the naan had been restocked for my second round. We were in and out of there in half an hour. 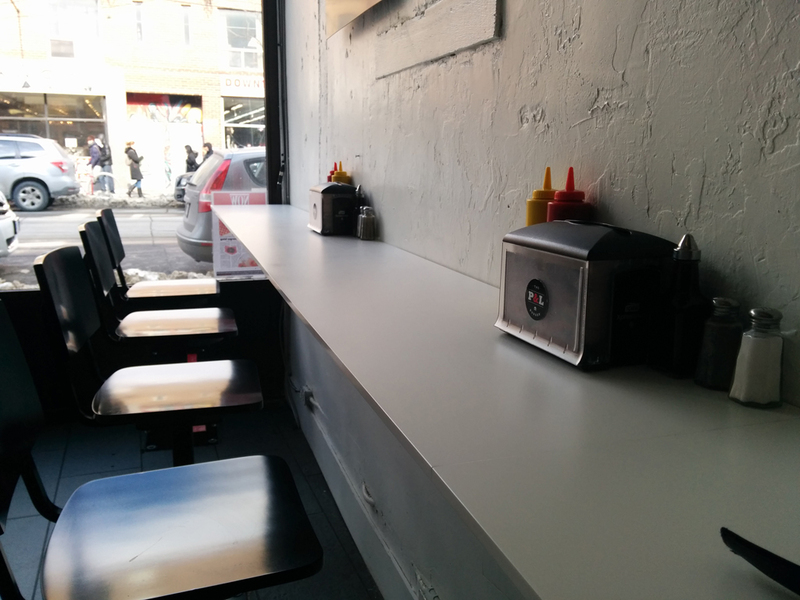 Burger Priest recently opened a new location- much closer, at Queen & Spadina. I thought I should give them a second chance. Plus I was craving burgers real bad. 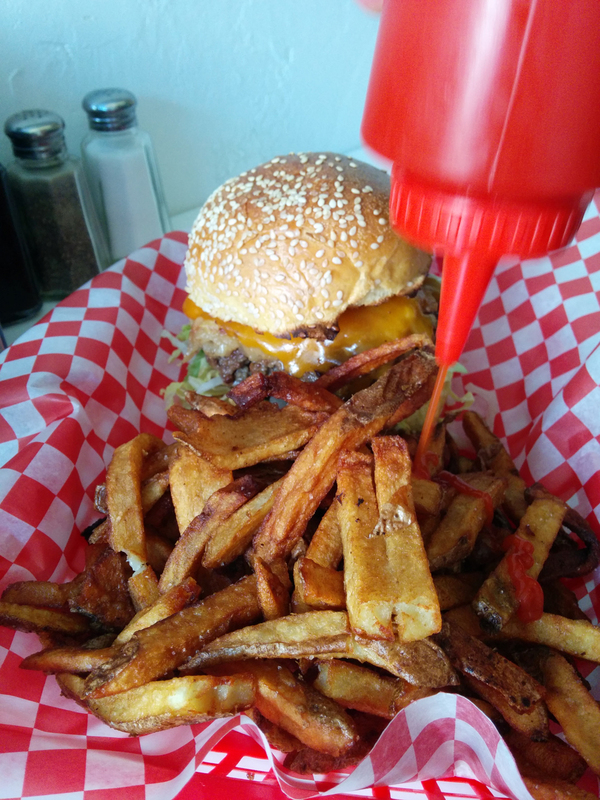 I had previously been kind of meh towards Burger Priest, maybe it was just my grumpy mood, maybe it was my inexperience with sopping-mess-of-a-burgers. Either or, it was time for a redo. I would not settle for just a burger, I wanted fancy, outrageous etc.. The Priest fit the bill, as I had previously had less than stellar experiences with “grilled cheese sandwiches for buns”: it was a burger with a breaded and fried portabello mushroom (their version of a veggie burger) on top. Really it was a combination of two burgers: a regular and a veggie. I was unsure if there would be cheese involved as it did not say on the menu, but the veggie one on its own was served with cheese. I secretly panicked that I would be eating a cheeseless burger. It is no surprise that I was voraciously hungry when we got there, I was also worried. Last time we went to Burger Priest the line was out the door, and this was just after opening hours. This time we arrived about 15 minutes before closing… the place was eerily empty for a Saturday night downtown. 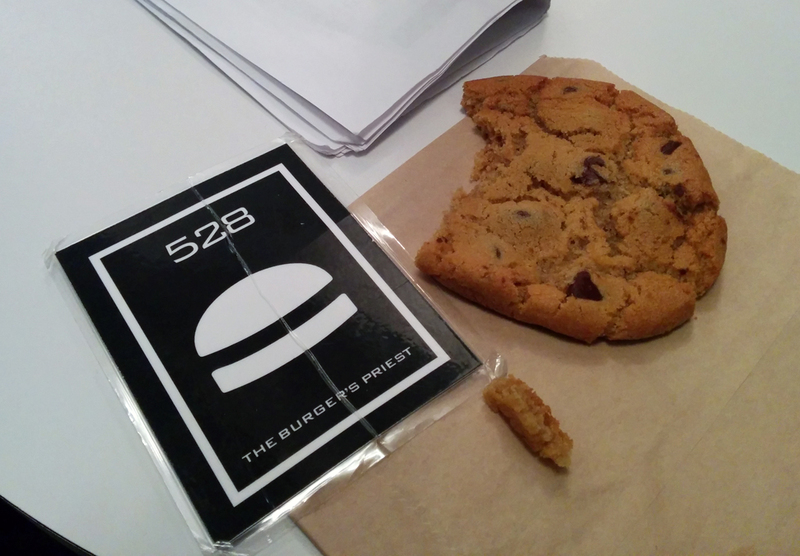 Luckily they also sell cookies, which was just enough to hold me over until my monster of a burger arrived. 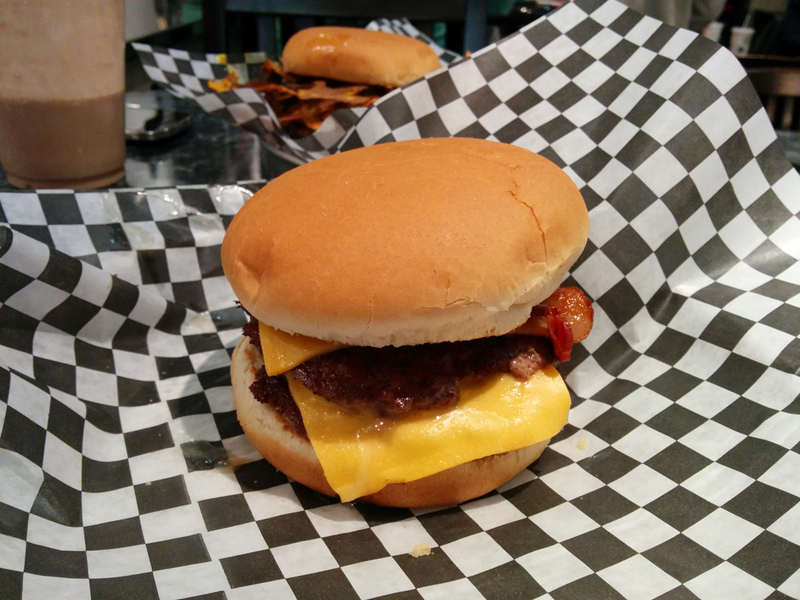 I can understand why Burger Priest was voted best cheeseburger since our visit: the cheese was amazing, it made the burger twice as good. It was a messy affair and at first glance I was afraid I would hurt my jaw trying to bite it, but it was easy to mash down to a biteable height. Yet again I found myself in burger heaven (although I admit it did make me yearn for In N Out burger afterwards). Brent was apparently hungrier than I… he went back for seconds. And not just another cheeseburger, oh no, he had his eyes on something bigger! He ordered The Priest, Vatican style. So a regular burger, veggie burger, cheese all sandwiched between two grilled cheeses. I was wary of it, as last time I had an epic burger like that it was impossible to eat and at some point I was eating just bread. In this case it turned out awesome because the bread itself was amazing (it had been buttered). 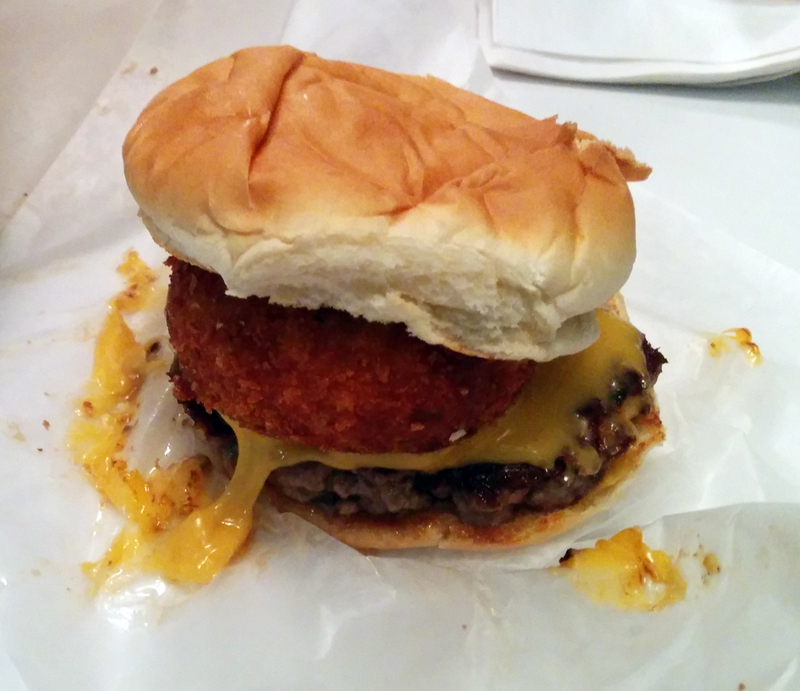 I cannot stress this enough: Burger Priest has the best cheese I have yet to try on a burger.